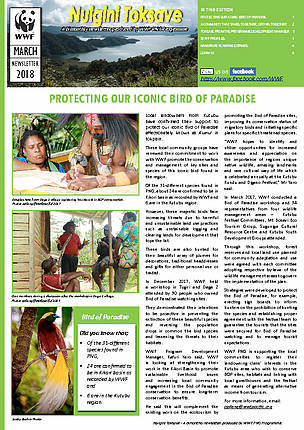 You will learn from this edition, the work the WWF-Pacific Papua New Guinea Country Office is doing at our project sites in the Kutubu where WWF is working with local landowners to protect our Iconic Bird of Paradise. In Madang, we continue our climate resilient work through our community led mangrove project along the north coast area. We also bring you a special report on how we are working to build financial resilience for 23 communities through a micro village savings and loans initiative. This project aims to increase the capacity of often vulnerable families and individuals to become better financial managesr by providing access to basic financial literacy training and savings scheme.